NOTICE: Requires the base game Fallout 4 in order to play. Activation key must be used on a valid Steam account, requires internet connection. 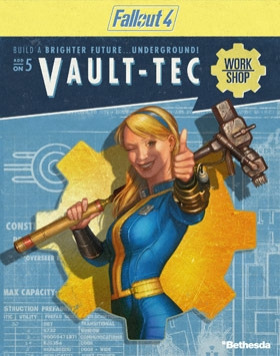 ABOUT THE GAME	Build a brighter future underground with the all-new Vault-Tec Workshop. Create a massive Vault and attract new Dwellers using pre-war industrial kits complete with retro-nostalgic furniture, lighting, and art. And like every good Ove… rseer, run Vault-Tec approved experiments on your Dwellers to learn what makes an ideal citizen. Vault-Tec has given you the tools, the rest is up to you! SYSTEM REQUIREMENTS Minimum: OS: Windows 7/8/10 (64-bit OS required) Processor: Intel Core i5-2300 2.8 GHz/AMD Phenom II X4 945 3.0 GHz or equivalent RAM: 8 GB RAM Hard disk: 30 GB free HDD space Video card: NVIDIA GTX 550 Ti 2GB/AMD Radeon HD 7870 2GB or equivalent Recommended: OS: Windows 7/8/10 (64-bit OS required) Processor: Intel Core i7 4790 3.6 GHz/AMD FX-9590 4.7 GHz or equivalent RAM: 8 GB RAM Hard disk: 30 GB free HDD space Video card: NVIDIA GTX 780 3GB/AMD Radeon R9 290X 4GB or equivalent © 2016 Bethesda Softworks LLC, a ZeniMax Media company. Bethesda, Bethesda Softworks, Bethesda Game Studios, ZeniMax, Pip-Boy, Vault-Tec and related logos are registered trademarks or trademarks of ZeniMax Media Inc. in the U.S. and/or other countries. Fallout, Vault Boy and related logos are trademarks or registered trademarks of Bethesda Softworks LLC in the U.S. and/or other countries. All Rights Reserved.